As readers of this blog you probably know that Simon and I are huge foodies and, having both struggled with our weight, balancing our love of cake whilst maintaining a healthy lifestyle is not always easy. So if something comes along to make things a bit easier for us, we're more than happy to give them a go. Just recently Simon in particular has been doing a lot of reading about eating more fruit and veg and has become a little obsessed with the idea of buying a juicer. 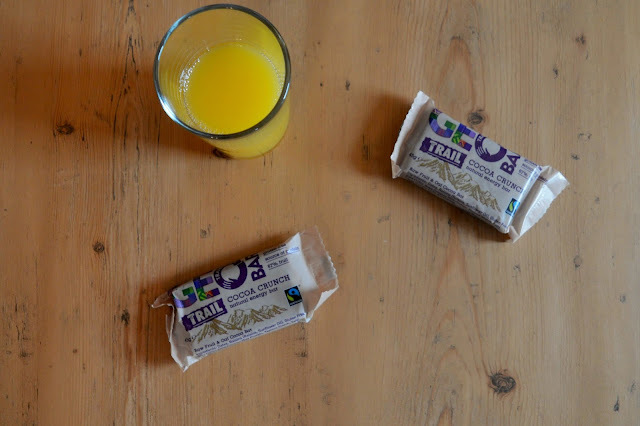 I fear slightly for our food bill and my nice clean kitchen so when Traidcraft sent us over some Geobars to try, I was keen to hand them over to Simon hoping that bars offering 60% + fruit as an ingredient will be enough to distract him from wanting to juice. Geobars were the world's first free trade cereal bars, created using fair trade ingredients from developing countries. 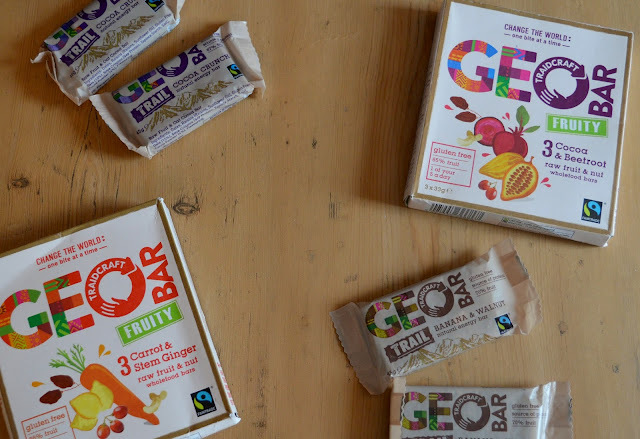 Apricots from Pakistan, raisins from South Africa and honey from Chile, these goodies are made into delicious snack bars right here in the North East of England. I hogged the Cocoa Crunch Bars for myself, eating them on my gym days as a pre-workout snack. 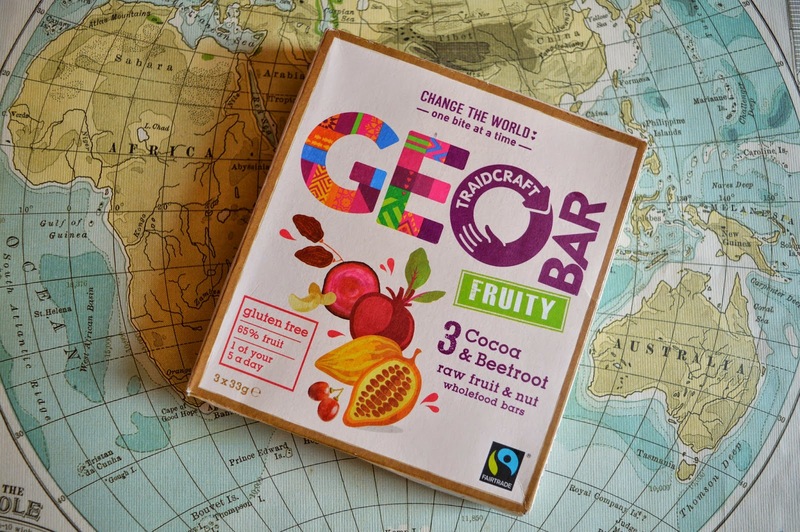 Unlike many other snack bars I've tried, I found the Cocoa Crunch Geo Bars to be really filling. As they are a raw fruit and oat energy bar, they were the perfect fuel for my evening runs. They were really sweet and delicious and I loved that the sweetness came from the raisins rather than any nasty added sweeteners. 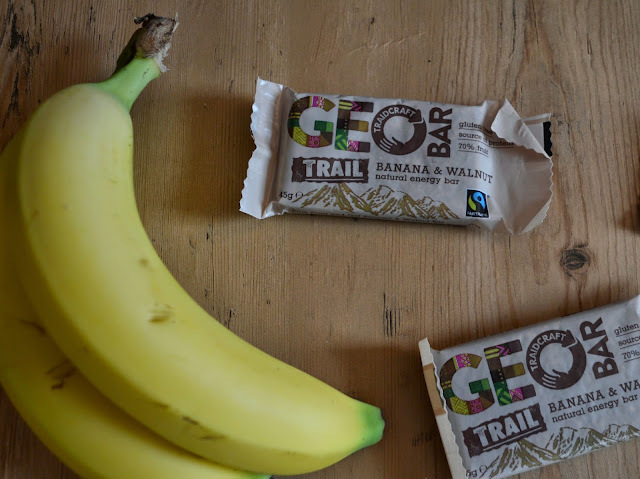 Simon took the rest of the bars to work with him, trying the Banana and Walnut Geobars first. Opting to have it as his mid-afternoon snack at work, he was surprised that the small bar kept him feeling full all the way through to dinner and came home with a happy report of how tasty his treat had been. I love Beetroot in chocolate cake so know how well Beetroot can work in sweet food, but I was a little worried Simon might not like the idea and was dubious about handing over the Beetroot and Cocoa Geobars to him. He kept an open mind though and was surprised at how delicious the bars tasted and how much he enjoyed them. I have to say I was most jealous of handing over the Carrot and Ginger bars to him, I'm a little obsessed with ginger at the moment and love how great it tastes. He came home full of praise for these little bars and said they reminded him a lot of carrot cake. We were so impressed with the Geobars and they tick so many "feel good" boxes - not only are they fair trade but they also count as one of your five a day, are gluten free and don't contain any added sugar .. all that and they taste delicious and are made in the North East! Winner! 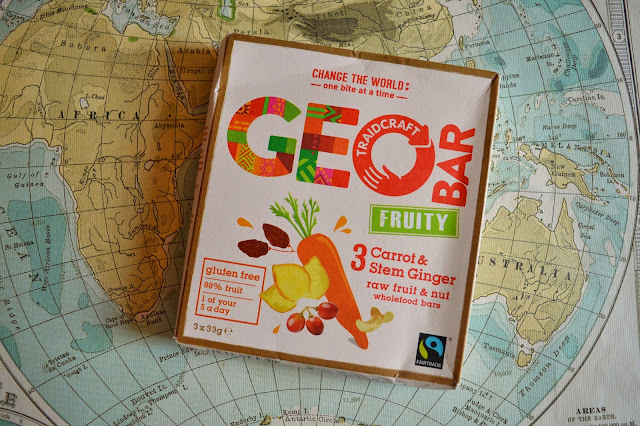 You can try Geobars for yourself by ordering from the Tradicraft website here or checking out your local Asda, Tesco, Sainsburys or Waitrose. The Geobars were sent to us for review purposes. Yum! I love geo bars. Have never tried the carrot and ginger ones though. They sound delicious too. Carrot and ginger sound delicious! I've just jumped on the juicing bandwagon! But these do look good, must try them with the kids!